Use These 7 Tips To Design Your Office Like A Pro! Office design doesn't have to be headache. By following the simple tips highlighted in today's blog post, you'll be ready to take your interiors to the next level. From effective measuring to adding versatile storage products, we've go your workplace makeover needs covered! There's nothing worse than purchasing office furniture for your space, only to find it doesn't fit properly when it arrives! The importance of effective measuring can not be understated and all professional office design projects start by obtaining accurate dimensions. While taking your dimensions down, be sure to take note of important power outlets, entry ways, windows, and other room obstructions that may affect they way your furniture fits. As they always say, measure twice and cut once. Take your time with this essential step to ensure accuracy! When it comes to office design, the pros always plan ahead. Set a doable timeline for your project from start to finish. Many of the industries top furniture collections are made to order. This means you'll be looking at about a 4 to 5 week lead time for manufacturing. As you don't want to settle for sub par desks and chairs for your business, leave plenty of time to ensure you can select the best products for your business needs. Once you're furniture is ordered, be sure to schedule delivery and obtain tracking information when available. If you're planning to have your furniture professionally installed, you'll want to schedule this asap. Booking an install company in advance will allow you to have your furniture assembled at a time that works for you and your business! Plan ahead as best as possible for your makeover. You'll be glad you did! Professional office designers always research the latest industry trends before purchasing furniture. Staying in line with the latest trends will ensure your space is on the cutting edge and ready to earn the guest compliments it deserves. This year trends like the use of gray office chairs have been booming. Open desking configurations have been rapidly replacing the classic cubicle layouts of the past. In addition, industrial inspired spaces that utilize glass and metal accents have also been quite popular. For boardroom makeover projects, powered conference tables are the way to go! Take the time to research these trends and take your interiors to the next level! Visiting businesses in your local area will help you find inspiration for your design project. This is also a great way to meet the neighbors and build relationships that can be beneficial in the future. If you see a space you like, don't be afraid to ask what type of furniture was used. You can also inquire about where they obtained their furniture and any tips that might be helpful for your project. As most office furniture showrooms are limited to only a few lines, visiting surrounding businesses for inspiration will help you design your space like a pro! Most designers will tell you to allot at least one day to visit showrooms and surrounding businesses. If followed, this beneficial tip will have you loaded with info and ideas for your interiors! While it's important to maximize the square footage of your space, you don't want to overcrowd! When designing your work environment, be sure to leave plenty of room to operate effectively. While you'll no doubt want your space to have all the latest and greatest products, show restraint and don't over do it!. When selecting your furniture, make a list of need and want items. Focus on the needs and essentials, then assess what adding more products will do to the overall functionality of your office. The right combination of ergonomic products will help you operate more comfortably and productively in the office. When designing your space, be sure to make ergonomic efficiency a primary focus. Start by selecting an adjustable ergonomic chair from a reputable brand. As you'll be sitting for approximately 8 to 10 hours per day, don't settle for a sub par seating solution. Brands like Global Total Office, Eurotech Seating, and RFM all offer excellent ergonomic chairs that won't break your budget. Next you'll want to accessorize! Integrating versatile products like Dual screen monitor arms will help you improve the rate at which you compute while helping you maximize usable desk space. Any professional designer will tell you, storage matters! While most will put a primary focus on aesthetic appeal and room accents, those who make storage a priority will be far better suited for effective business. Wall mount hutch units will help you save floor space and should be considered for nearly every interior. 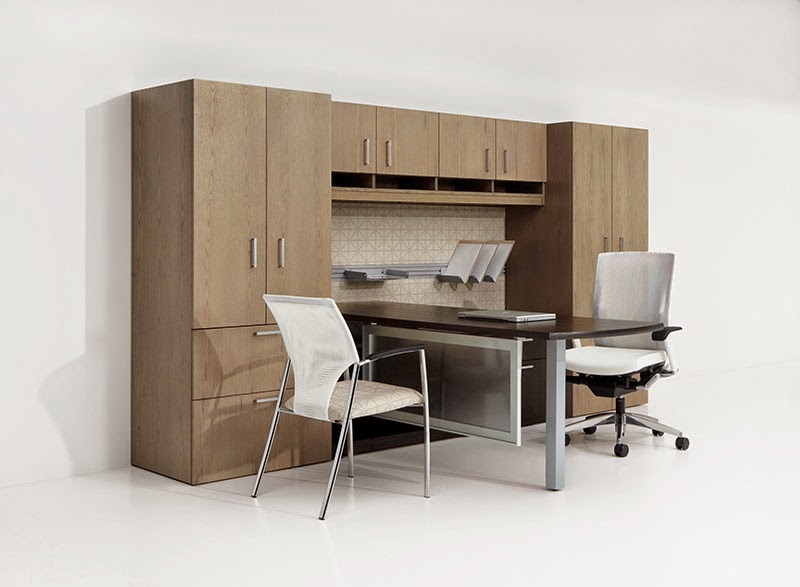 While file cabinets will always have their place in business, modern storage solutions like mobile file pedestals and combo storage units are becoming the industry standard. Evaluate your storage needs and plan accordingly. When adding storage products to your space, be sure to leave room for future growth to ensure you're ready to stay organized now and in the future.